Last week, I was watching Through The Worm Hole with Morgan Freeman. The episode talked about long distance space travel. One of the segments discussed teleportation. It involves dematerializing something at one point, and transmitting the details of that particular object’s precise atomic configuration to another place in space. Big thinking to be sure. The scientist used a pie and blended it as a metaphor for teleporting. He blended that pie to show how information changes if it were to move from one point in space to another. It would be a scramble. I thought that was brilliant. Not using the pie as a metaphor, but baking a pie, blending it, and reconstituting it . So pie 35 is the cherry teleport whipped cream pie. The pie recipe came from Joy of Baking, but with a few mods. until the dough just holds together when pinched. If necessary, add more water. Do not process more than 30 seconds. Turn the dough on your work surface and gather into a ball. Divide the dough in half, flattening each half into a disk, cover with plastic wrap, and refrigerate for at least one hour. After the dough has chilled sufficiently, remove one part of the dough from the fridge and place it on a lightly floured surface. Roll the pastry into a 12 inch circle. Transfer to a 9 inch (23 cm) pie pan. Brush off any excess flour and tuck the overhanging pastry under itself, crimping as desired. Refrigerate the pastry, covered with plastic wrap. Remove the second round of pastry and roll it into a 12 inch circle. Place on a parchment paper-lined baking sheet, cover with plastic wrap, and place in the refrigerator. Combine the flour, salt and sugar in a medium-sized bowl. Cut the butter into small chucks and add to the flour mixture. Using a pastry blender or two knives in a criss-cross motion, blend the butter into the mixture until it has the consistency wet sand (sweet, delicious wet sand)with a few pea-sized pieces remaining. Using a fork or whisk, beat the egg yolk and the water. Pour the egg mixture over the flour, stirring only until the mixture becomes moist. The dough should stick together and be able to hold the form of a ball. Cover the dough with plastic wrap and flatten into a disk. Chill in the fridge a minimum of 30 minutes. To roll it out, I used a cloth dinner mat. Flour the surface, cover the dough with your plastic wrap and roll out into a 9 inch circle. Transfer to a 9 inch pie plate. Trim or fold the excess under the edge of the crust and flute. Place a pie weight or beans in tin foil over the center of the crust. Bake at 350 degrees for 10 minutes. Remove the weight from the crust and bake an extra 7-9 minutes or until the edges are golden brown. Set aside to cool. It's still a cherry pie, its data is just altered. And delicious. Pre-heat the oven to 425F and place the oven rack in the lower third of the oven. Place the cherries in a large bowl. Add the sugar, tapioca, salt, lemon juice, vanilla extract, and almond extract and gently toss to combine. (If using canned cherries also add the 1/3 cup reserved cherry juice.) Let sit for about 10-15 minutes and then pour the mixture into the prepared, unbaked pie shell and dot with the 2 tbsp. of butter. Lightly brush the rim of the pastry shell with the heavy whipping cream. Cover top with your second pie crust and cut slits ( or your own design) to vent. Brush the entire surface with the cream. Place the pie on a larger baking pan, lined with parchment paper, to catch any spills. Bake the pie for about 15 minutes and then reduce the oven temperature to 350F. 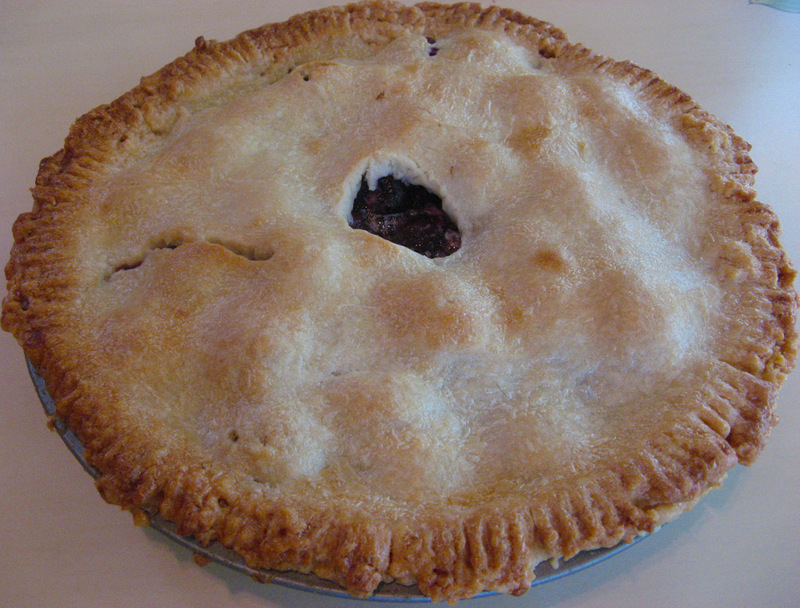 Continue to bake the pie for about 25 – 35 minutes or until the crust is a deep golden brown color and the cherry juices are starting to bubble. If the edges of the pie start to brown too much during baking, cover with a foil ring. Place the baked pie on a wire rack to cool for several hours. Once pie has cooled, cut it up and throw it into a blender. I used a Vita-Mix. 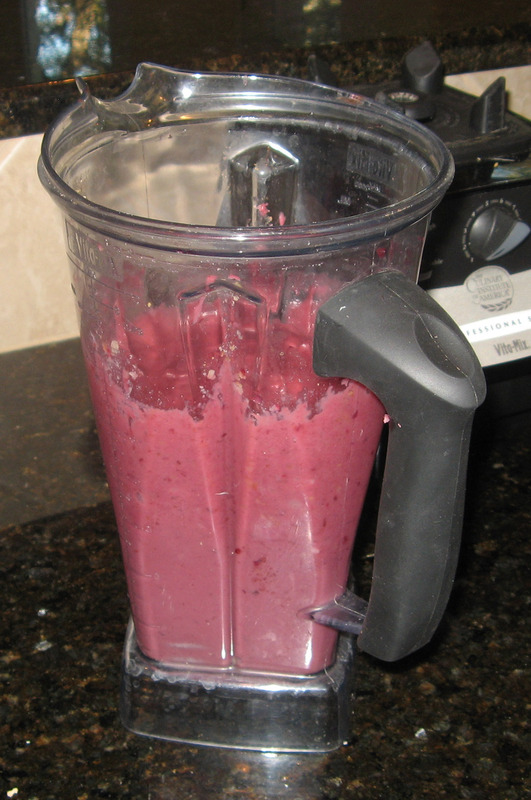 Blend for 1-2 minutes. 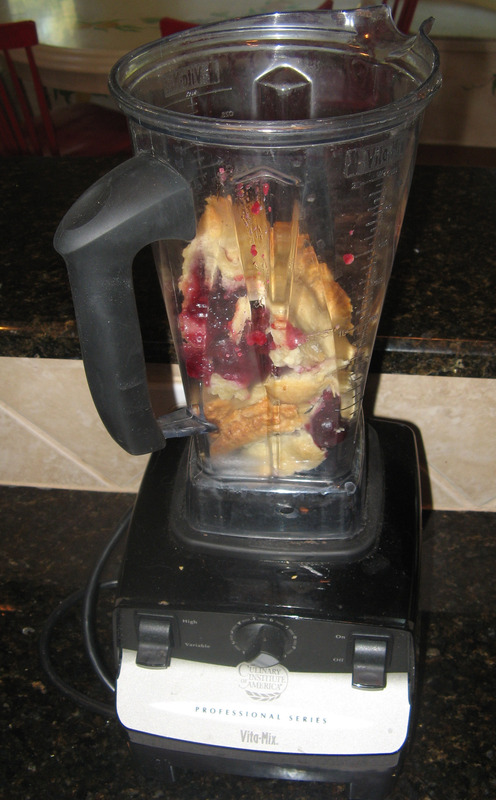 I was able to get the pie blended but the Vita Mix kicked it. My wife is gonna be maaaaad. Pour the blended pie into your baked pie crust. In a large bowl combine the heavy cream, sugar and brandy. Whip until stiff. spoon over the filling. Be wary of adding too much booze, my whip cream fell and now looks strangely like tapioca. Fail. It should last 3 days in fridge. In 1993, physicist Charles Bennett and a team of researchers at IBM confirmed that quantum teleportation was possible, but only if the original object being teleported was destroyed. Check. I’m ahead of the curve. I destroyed 2 things. Then there’s that whole it’s-not-the-same-pie thing. It’s like that movie with Jeff Goldblum. The one where he transports but there’s a fly in the transporter. Same thing happens with pie. On the taste side of things, the cherry flavor doesn’t pop like I thought it would. And the texture of the whipped cream needs some improvement. It’s also really heavy. Like pudding. It’s still good but doesn’t really excite. Oh, the things I do in the name of science. 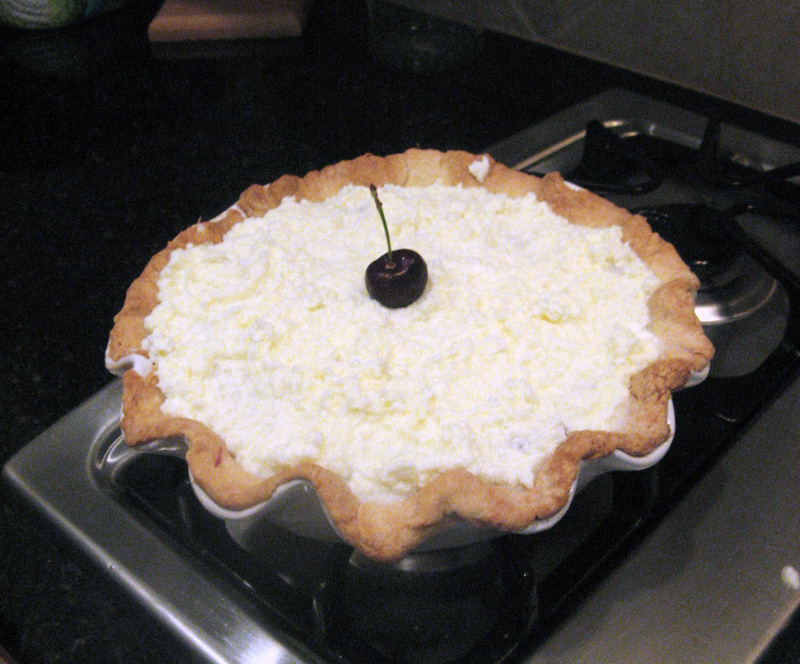 This entry was posted in Booze Pies, Cherry Pies, Homemade Pie Crust Pies, Unique Pies and tagged Baking, Blended Pie, Cherry Pies, Dessert, Pie, Recipe by pieofthebeholder. Bookmark the permalink.